Brandon spent Monday asking what he should be reading, I’m going to help everybody out and tell him what he should be ordering is Book 2 of the Abominable Charles Christopher. If you aren’t familiar with Charles Christopher, it’s an amazing web comic by Karl Kerschl. The strip stars a bigfoot-like gentle giant but is far more complex than that. There are multiple storylines running through the comic and I can honestly say that I love them all equally. 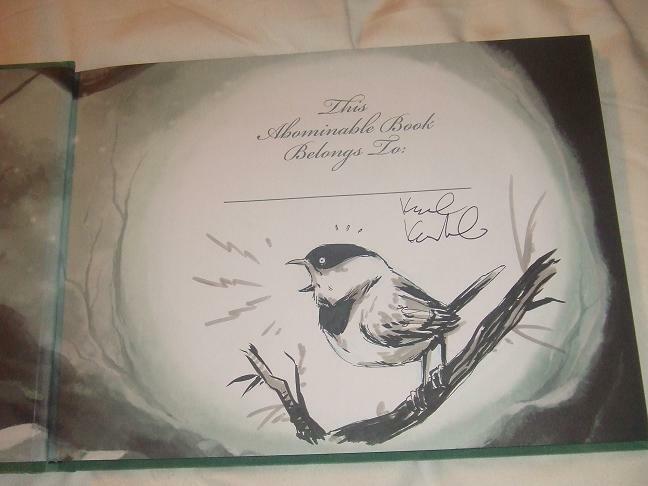 Back in July of 2010 I received my sketch edition of the first book. The hard cover was produced in a limited run and I’ve met a number of people trying to track one down. Now is your chance to get a hard cover of Book 2! The story only gets better, so I’d imagine the second hardcover will become as hard to find as the first. Just like with the first book, Karl is doing sketch editions for Book 2. I had to skip on the sketch this time, but the above picture is what is in my Book 1. Karl’s art is amazing; if you have the extra money to spend it really is worth it. You’ll have to wait a little longer for the book that way, but again you’re getting a fantastic piece of art. Check out the Abominable Charles Christopher website for more information.